Register for "News You Choose"
Parents are encouraged to volunteer at Centreville ES. For specific classroom opportunities, parents can contact the classroom teacher or parent liaison. Tasks may include working with students, helping with art projects, performing clerical jobs, and preparing instructional materials. Additional volunteers are needed for the Centreville library, where assistance is needed to shelve books and more. All volunteers are required to stop at the main office to sign in and receive a badge to wear when visiting the school. We do not permit younger children, friends of students, or students from other schools to visit classrooms except with the principal’s approval. 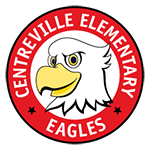 The Centreville PTA coordinates many volunteer opportunities that take place either during the school day or in the evening.